A term sheet is something used in a business agreement. The sheet will outline the terms and conditions of the transaction or deal as proposed by the interested party. A term sheet is usually a preliminary look at a transaction, so it is a non-binding agreement. This sheet usually uses bullets to identify important points of the business agreement. This bullet-point style is what makes a term sheet differ from a letter of interest. Another differing point is that a term sheet may be used as a proposal, instead of a solid final agreement. You might send the term sheet to multiple venture capital firms or angel investors who are considering an investment in your company. When making a term sheet, you should include as much information as possible to make your proposal complete. This will ensure that there is no confusion as to the terms and conditions being offered for the business agreement. A good term sheet will lead to a quicker final transaction. A term sheet is different from KISS docs, SAFE docs, and convertible debt. 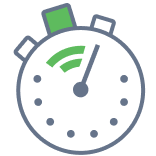 Create a free Term Sheet in minutes with our professional document builder. A term sheet is intended to outline the terms by which an investor will make a financial investment in a company. A term sheet outlines the basic terms of a deal to ensure that the parties agree on general terms before beginning the due diligence process. If you have questions about your term sheet, you should seek legal advice from a law firm that is experienced in corporate transactions. When should you use a term sheet template? You should use a term sheet if you are interested in offering parts of your business for purchase and you want to provide general terms of the deal for potential investors to review. 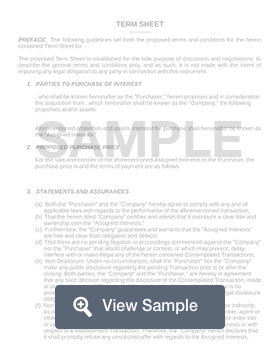 A startup term sheet is drawn up before the rest of the legal financing documents. It states the basic terms and conditions of the proposed investment. Valuation - Indicates what percent of the company the investor will receive for their money.